Christmas in South Africa is a summer holiday. Therefore the customs of Christmas observed in South Africa are different from those observed in the northern hemisphere. For children the Christmas season means a month-long break from school. Adults, on the other hand, plan trips to the beach, the river, or the mountains if they can get the time off from work. A number of Christmas traditions celebrated by some South Africans reflect the country’s heritage as a British colony. As the days of colonization slip farther into the past South Africa is developing its own Christmas customs. Christmas decorations in South Africa display a simple elegance. Houses are decorated with pine branches. Inside the house a Christmas fir stands in a corner with presents placed around it. On Christmas Eve children hang their stockings for Father Christmas to fill. Fruit, nuts, sweets, and other goodies fill the stockings as well as toys, in the homes of more well-to-do families, or more practical items, like school supplies, in other homes. South Africans love to sing, especially during the Christmas season. 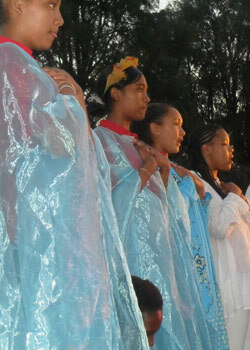 Many will spend a portion of their Christmas Eve attending a Carols by Candlelight event full of singing and pageantry. They also form groups of carolers and sing throughout the neighborhood at homes and on street corners. Christmas day dawns bright and warm. Many attend church services before beginning Christmas celebrations at home. Christmas day in South Africa is spent relaxing with family and friends. While gifts are given, mainly to family and a few select friends, gifts do not give meaning to the Christmas holiday. By mid-day temperatures are rising causing many to decide to have an outdoor lunch instead of a larger Christmas dinner. Wherever the Christmas dinner is served the following foods are usually found: turkey, roast beef, mince pies, suckling pig, yellow rice with raisins, vegetables, and plum pudding. Put all the dry ingredients in a processor. If not using a processor, put in a mixing bowl, and mix well. Add the eggs, and process well until a thick batter forms — or mix well in the mixing bowl. The batter should almost hold its shape when tested with a spoon. If the batter is too stiff, add a tiny amount of milk. If by any chance it is runny, add more flour (shouldn’t happen!). Heat oil in a pan, using medium to high heat to start with. Scoop up heaped tablespoons of batter, and drop into pan, but not too close together. You won’t have huge fritters as some of the batter will stay clinging to the spoon. (You could use a non-stick pan and not use oil or butter, but a little oil is preferable). The fritters will puff up slightly and keep their shape, but will deflate a bit as you take them out of the pan. To test for doneness, press very lightly on the fritters. When done, they will tend to spring back. If still uncertain, press harder: no batter should run out the sides. NOTE 1: The pumpkin MUST be dry. We do not have canned pumpkin in South Africa, and would use home-cooked pumpkin. Whatever: drain very well, or cook the pumpkin in a pot without a lid until all water has evaporated. NOTE 2: I do not know if your canned pumpkin is sweetened. If so, don’t add sugar — it’s your choice. NOTE 3: I specified yellow sugar, which Zaar’s format does not recognise. Use brown or white if no yellow granulated sugar available.